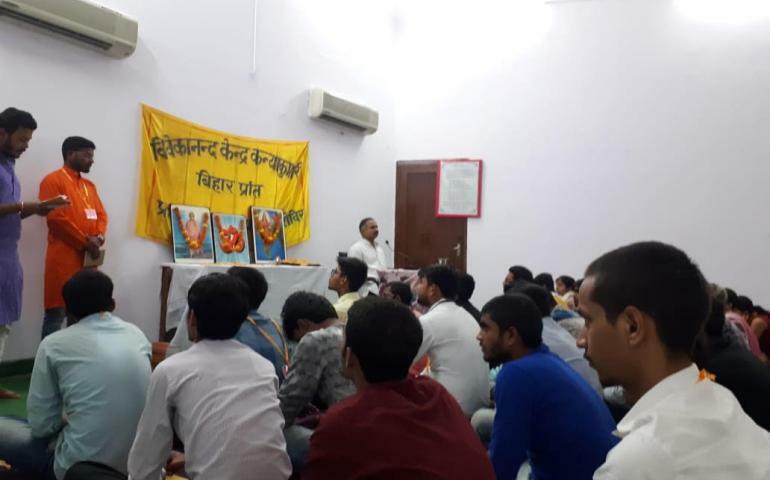 “Utho Jago Bharat” Pratiyogita shivir was held at Deep Narayan Sahkari Sansthan Patna under the Aegis of Vivekananda Kendra Kanyakumari Branch Patna From 13 October to 16 October 2018. 43 participants from 3 different District of Bihar, Reported on 13th October morning and same day the participants attendant the Introductory Session , Wherein the participants were given the guidelines of the shivir . 43 Participants were organized in to four different Ganas ,- Nagarjuna , Dashrath Manjhi, Ramdhari Singh Dinkar and Vindhavasini Name of Famous personality of Bihar . The Four day Shivir had PratahSmaran ,GitaPathan ,Yogabhyas ,Shram Samskar ,TwoLectureSession ,Manthan ,Geet ,Mantra Abhyas ,Bhajan Sandhya and Concluded with Prerana Se Punrutthan. The Shivir Went on Well in a Congenial ,Spiritual Atmoshpere With Self Discipline. The Shivir Concluded On 16th October 2018 afternoon With Special Blessing of Manniya Mukesh keer G ( Prant Sanghathak of Bihar Jharkhand Prant ) of Vivekananda Kendra , The Shivir Concluded With Kendra Prarthana. Many of the Participants have expressed their willingness to Devot their time and Energy for the Service of Society through Vivekananda Kendra.